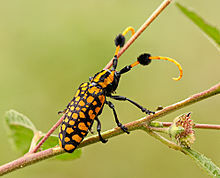 The longhorn beetles (Cerambycidae; also known as long-horned or longhorn beetles or longicorns) are a cosmopolitan family of beetles, typically characterized by extremely long antennae, which are often as long as or longer than the beetle's body. In various members of the family, however, the antennae are quite short (e.g., Neandra brunnea) and such species can be difficult to distinguish from related beetle families such as the Chrysomelidae. The family is large, with over 26,000 species described, slightly more than half from the Eastern Hemisphere. Several are serious pests. The larvae, called roundheaded borers, bore into wood, where they can cause extensive damage to either living trees or untreated lumber (or, occasionally, to wood in buildings; the old-house borer, Hylotrupes bajulus, is a particular problem indoors). A number of species mimic ants, bees, and wasps, though a majority of species are cryptically colored. The rare titan beetle (Titanus giganteus) from northeastern South America is often considered the largest (though not the heaviest, and not the longest including legs) insect, with a maximum known body length of just over 16.7 cm (6.6 in). The scientific name of this beetle family goes back to a figure from Greek mythology: after an argument with nymphs, the shepherd Cerambus was transformed into a large beetle with horns. As with many large families, different authorities have tended to recognize many different subfamilies, or sometimes split subfamilies off as separate families entirely (e.g., Disteniidae, Oxypeltidae, and Vesperidae); there is thus some instability and controversy regarding the constituency of the Cerambycidae. There are few truly defining features for the group as a whole, at least as adults, as there are occasional species or species groups which may lack any given feature; the family and its closest relatives, therefore, constitute a taxonomically difficult group, and relationships of the various lineages are still poorly understood. ^ "Cerambycidae Latreille, 1802". Integrated Taxonomic Information System. Retrieved June 6, 2011. ^ Gomes Gonçalves, Marcos Paulo (December 2017). "Relationship Between Meteorological Conditions and Beetles in Mata de Cocal". Revista Brasileira de Meteorologia. 32 (4): 543–554. doi:10.1590/0102-7786324003. ISSN 0102-7786. ^ Max Barclay (2010). "Titanus giganteus Linnaeus (1771)". Natural History Museum. Retrieved June 6, 2011. ^ Sergio Antonio Vanin & Sergio Ide (2002). "Classificação comentada de Coleoptera" [An annotated classification of the Coleoptera]. In C. Costa; S. A. Vanin; J. M. Lobo & A. Melic. Proyecto de Red Iberoamericana de Biogeografía y Entomología Sistemática PrIBES 2002 (PDF). Monografias Tercer Milenio (M3M) (in Portuguese). 3. pp. 193–206. ISBN 84-922495-8-7. ^ Miguel A. Monné (2006). 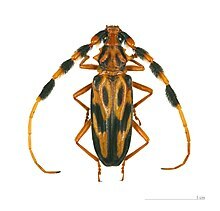 "Catalogue of the Cerambycidae (Coleoptera) of the Neotropical Region. Part III. Subfamilies Parandrinae, Prioninae, Anoplodermatinae, Aseminae, Spondylidinae, Lepturinae, Oxypeltinae, and addenda to the Cerambycinae and Lamiinae" (PDF excerpt). Zootaxa. 1212: 1–244. ISBN 1-877407-96-8. ^ Arnett, et al. (2002). American Beetles, Vol. 2. CRC Press, 861 pp. ^ Patrice Bouchard; Yves Bousquet; Anthony E. Davies; Miguel A. Alonso-Zarazaga; John F. Lawrence; Chris H. C. Lyal; Alfred F. Newton; Chris A. M. Reid; Michael Schmitt; S. Adam Ślipiński; Andrew B. T. Smith (2010). "Family-group names in Coleoptera (Insecta)". ZooKeys. 88: 1–972. doi:10.3897/zookeys.88.807. PMC 3088472. PMID 21594053. Archived from the original on 2011-07-21. Wikimedia Commons has media related to Cerambycidae. Photo gallery "Longhorn beetles (Cerambycidae) of the West Palaearctic Region"
This page was last edited on 27 February 2019, at 03:33 (UTC).